This review is brought to you with limited commercial interruption. After two episodes, it is time to shake the oracle again. A hero is as hero does. 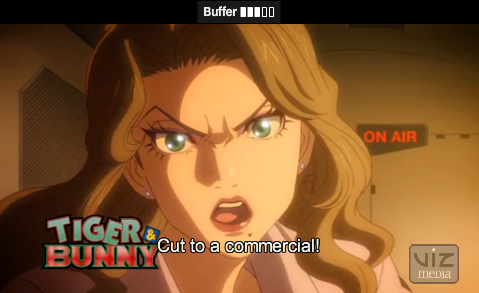 So far Tiger & Bunny has succeeded in my estimation. But note well: the show does not contain a sentai feel, because what appeared to be a team in the preview, is instead a group of competing individuals. I also recommend reading Ghostlightning’s post on the difference in the morality of adult heroism versus the heroism of children. You’re right in that it doesn’t have a sentai feel but instead have what seems to me a very American idea of a superhero. More than this, a postmodern take on the whole concept — as portrayed by Greg Kinnear in his turn as Capt. Amazing in the Miracle Men movie in ’99. I think The Incredibles have more of this, as well as Rob Liefeld’s Youngblood (UGH) for Image Comics back in the ’90s. I’m not that knowledgable in comics history and lore so there may be many other precedents. The idea of ‘sponsored’ heroes isn’t that new, if you consider Government co-opted heroes like Capt. America… but also Dr. Manhattan in the Watchmen. The Government-sponsored hero seems more palatable in the sense that the Government is morally bound to serve the interests of its constituents, while corporations are serving the interests of its shareholders… but both sectors are routinely portrayed as villains in media so eh. In any case, I do think the show is quite interesting. @Klux: Yes, too early to know how it will turn out, but they are off to a good start. @ghostlightning: I think the sponsored look also makes it look American, because it reminds me of NASCAR. Yes, though international motor sports, yachting, football, have for a long time used their sportsmen and machines as billboards for brands. Yeah, but having recently lived in Nashville, TN, I can’t help but think of NASCAR. 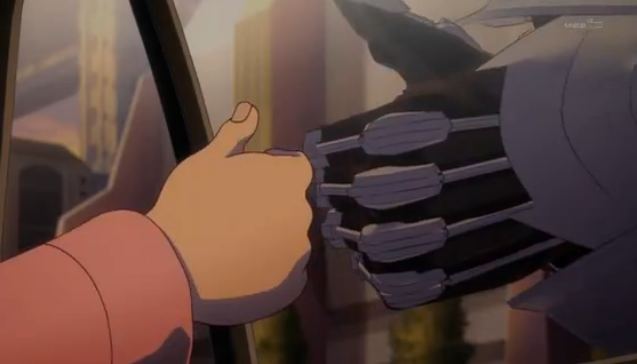 This show really is very western, isn’t it? I think that’s actually hurt the show’s appeal in some circles, since superheroes are one of those things that a lot of fans watch anime to get away from. Still a really fun show so far though. I think those are pretty fair comments. If people hadn’t been thinking “superhero” they might have given the show more of a chance. Also, it seems to me, so far at least, that it could be dubbed and seem extremely western, in part because they have been avoiding a lot of standard anime conventions (like a school setting). In addition, the commercialism in general, and the central role of the TV show seem very western. Just a feeling, but I reckon if this show works out well, it might actually get sold to the ‘west’. All of the English they use, such as the news ticker, and the closure notice were written in proper English. The characters themselves look Superhero-ish enough for them to appeal to western audiences as well.. Sorry, I meant the show being dubbed and shown on Saturday mornings to children and whatnot.. Possibly. I have fond memories of watching cartons all Saturday morning. In fact, it wouldn’t be an overstatement to suggest that I pretty much lived every week looking forward to Saturday morning… the one morning I would wake up early, so I could start watching cartoons. I watched legion of the superheroes, and spiderman and his super friends, as well as classics like Top Cat. Good times. Funny, I don’t even remember what you are talking about. In general, I think things aren’t suitable for children unless a parent is watching with them to ask questions like, “you wouldn’t do that, would you?” or “do you think she made the right decision?”. Take the Bible, for example. It barely starts and you have people disobeying the rules, and killing their brother and so forth; this sets a bad example for children. YES! I’ll have to admit I watched too much of those shows, as I watched too much TV in general as a kid. Anyways, it’s a fun watch for now, and we’ll see how they handle the relationships as the season progresses.